After last summer's heat and drought I thought we'd lost our pastures. Every one of them was dry and brown by autumn, with no grazing for any of our grazing critters: goats, chickens, or ducks. is no green forage, they've been on acorn hunts every day. It's pretty discouraging to think we'd have to start over, especially since that's a far cry from my original goal to work on soil and forage improvement in a rotating manner, focusing on one area per year. It seemed as though all our work was for naught. Rain at the end of November and throughout December finally moistened our hard parched soil. That meant time to start working on the pastures again. I bought seed and conferred with Dan. We had a lot to do. Imagine my delight, then, to be walking through the doe pasture on my way to feed the bucks and to see this. clumps of seedlings! Trouble is, I don't know what these are yet: from seed I planted? from random seeds in the barn mulch? from weeds I'm trying to get rid of? I also found some yarrow that had survived. Yarrow that survived the summer heat and drought. I don't just plant pasture forage (grasses and legumes), I also plant herbs, root crops, greens, etc. before I scatter the seeds. Jessie (white one) ate a few. One unwanted that survived the summer was several patches of ground ivy. Ground ivy (Creeping Charlie). A little weather worn from the cold, but alive. This stuff almost completely took over the doe pasture two summers ago (click here to see how the pigs helped with that). In my research I read that it is sensitive to soil boron, and that an application of borax can deter it. Used as a source of boron for both soil and goats. I tested this idea last summer along a fence where ground ivy was growing and discovered that it was true. Instructions in this article say to make a solution of it and spray it on. I couldn't get it to dissolve, so I lightly dusted the ground ivy with borax right out of the box. Sure enough, it died back where I'd sprinkled the borax. The problem with the borax treatment is that other plants can be sensitive to boron as well, which could create barren areas in the pasture. On the other hand, if the ground ivy takes over again I could lose the entire pasture again. Hopefully I'll just kill off the ground ivy and the rest will thrive. My soil is actually boron deficient. This comes up in soil tests and in the goats. Lack of boron in goats causes joint problems which can be detected by a "clicking" of the knees. When that happens I start adding borax to their feed, "as much borax as will adhere to the tip of the finger" according to Pat Coleby. That clears up the problem. Even with new growth appearing I will still spot seed bare areas and mulch as much as I can. It's time to clean out the doe barn so I'll plant and mulch the barest areas with a deer and turkey forage mix of wheat oats, and Austrian winter pea, plus some brassicas and other herbs and greens. (an idea inspired by Masanobu Fukuoka's The One-Straw Revolution). January and February are typically our coldest months so I probably won't get much growth until early spring. But at least it wasn't as bad as I feared, and I'm thankful for that. We wish you a very blessed Christmas. Does it seem to anyone else that the year has flown by? When we were having our endless days of drought and stifling heat last summer I thought it would never end. Now that's all behind us, we're getting plenty of rain, and the year is rapidly coming to a close. That means it's evaluation time. It's time to take a look at our 2016 homestead goals and analyze what we've accomplished, what we haven't, and what we've changed our minds about. We're actually getting close to finishing the house, at least on paper. The doing takes longer! This year we wanted to finish the dining room windows, finish the front porch, and install our 1550-gallon rainwater tank. The dining room windows can be checked off the list. than the window on the right, but they are actually the same size! I can't believe how much warmer the house stays now that these windows are done. Energy efficient windows and good insulation make all the difference in the world. Such energy upgrades are well worth the investment. The front porch is almost done. Here's what it looked like before. 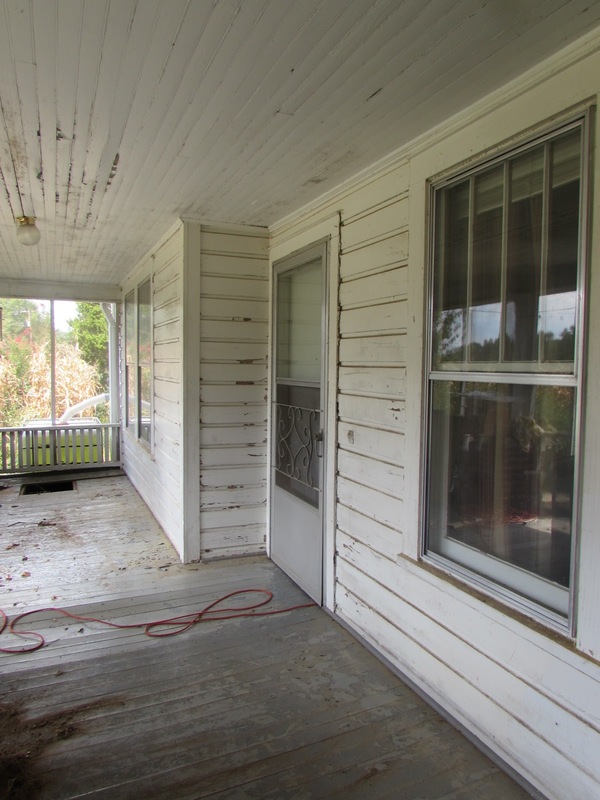 We started on the front porch in Sept. 2014, floor first. Dec. 2016. The wood box is still in the way, but you can see the difference. We want to replace the ceiling and then the remaining corner trims can be put up. Hopefully we'll do that next year and then the front porch will be done - an example of an annual goal staying on the list for several years. 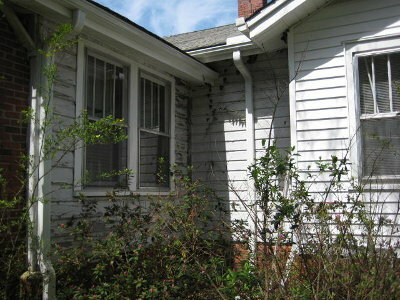 but the question was whether we wanted to install the tank first and then later go back to replace those windows and siding, or do the windows and siding first and then install the tank. January 2016. The dining room windows were part of this project's detour. Doing the windows and siding first won out. By the beginning of the year it was mostly done except for waiting on warmer weather to finish the caulking and painting. Finally Dan was able to level the ground and get it in place. The only thing left to do is make a filter for it, then we can at last get it hooked up. This was to be our big project for 2016. This was the original plan for my dream barn. We started with that floor plan and the purchase of a sawmill. About the time Dan got all his lumber cut, the roof on goat shed started to leak. then so we tarped it. When it started leaking again, we decided to re-roof. 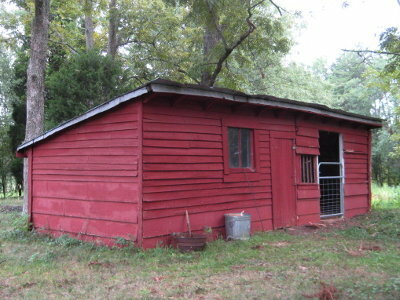 The old shed is still there, now the left side of the "Little Barn." So that was a necessary detour, but it allowed curing time for our home-cut lumber. Building the "big" barn will be the big project of 2017. The "little" barn will then become a better workshop for Dan. Fencing our woods is an annual carry-over goal. It stays on the list because it's important, but it's not a straightforward project. There's no vehicle access along the property line and there are numerous fallen trees blocking even a footpath. With the barn taking priority this year, we weren't sure how far we could get. When our summer drought dried up our pastures, I started taking the does for daily walks in the woods. To pass the time while they forage, I've been working on finding and clearing the old fenceline. In some spots it's slow going. I follow the old fence. bought the place we paid a surveyor to find & mark all these. I get so far and then Dan comes down with the chain saw and clears away the big stuff. We have two rolls of 330-foot goat fencing and a pile of t-posts, so we may actually be getting closer to making this a reality this winter. We would love to be better using all of our five acres. My goal this year was to add two more hives for a total of three. Sadly I lost all three colonies and am now beeless. I haven't decided what to do. I definitely still want bees, but I don't want to go with package bees again. Folks seem to have a lot of trouble keeping package bees alive. I may try again to catch a swarm or find someone selling nucs. tanks were empty, it succumbed to the drought and heat. This year I wanted to focus on year-round gardening. Most folks think of that as expanding the harvest to the winter months. Me too and I'll blog about that soon. This past summer, however, has me revisiting thoughts I've had in the past - that my gardening break ought to be in July and August, not winter. Everything struggles so when we have our hot dry spell every year, whereas there are a lot of cool weather crops that do well for me all winter. I'm thinking I need to invest in a non-traditional gardening "hat" and plan a little differently for next year. I never considered this a homestead goal before, but in a way it is. 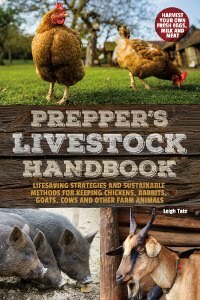 I love to share what we're learning, but also, it helps support the homestead. Not in a huge way, but we've been able to buy quite a few necessary and useful things for our lifestyle from book money. 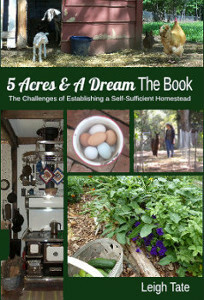 My goal this year was to work on more volumes for The Little Series of Homestead How-Tos, and I managed to publish seven new additions. Some folks ask where do I find that time. I find it in the pre-dawn hours, somewhere between letting the cats out and time to do chores. All of my books are on sale through the end of the month. Click here for details. This was another goal that was new to the list. I added it because I wanted to focus on two things: acquiring more alternative tools and getting hard copies of information that I consider a good resource. I already mentioned Dan's sawmill. It's not alternative in the sense of powering it (it has a gasoline engine) but it does increase our self-sufficiency in that we can cut our own lumber. Considering the number of mature pines falling down in our woods, this is a real win-win. In terms of alternative energy we installed a solar attic fan. And a solar barn light. Also I bought was a wind-up clock. I'm still working on hard copy collections of notes and useful notes. Not the stuff I've learned from experience, but things that are occasionally useful. I have to say it's convenient to have the notebooks. It seems to take less time to flip to a page than to search through scores of computer folders, book marks, or websites. For me, anyway. Whew, that was a lot, but all in all, we did pretty well at meeting our goals, with the Little Barn being our only major but necessary detour. How about you? Was it a productive year or one filled with the unexpected? Once the window was installed, the next step was putting up the new barn-board-look exterior siding. That required furring strips. We are nailing the new siding panels directly onto the the old ship lap siding. The only prep was to wash it down with bleach water to kill any mildew (not uncommon with our humidity). One can never have too much insulation! On this side of the house especially, because it gets the hot afternoon summer sun and in winter receives blasts of cold wind from the west. Insulation will be added between the studs after the siding is put up. Dan foamed the gaps around the window before installing the trim. How different it looks with the siding! I'll have to get used to how much smaller it is, but I like the higher horizontal placement for a bedroom facing the road. Window and corner trims were put up last. You can see what it looked like before in the first post in this series. We won't do the interior wall until after the other two windows in this bedroom are replaced. They will be identical to the ones on the left. Fortunately, we bought all four windows at the same time. After that we can put up the new siding and paint. Still to do on the front porch is the ceiling, then we can finish the rest of the trimwork. We're getting close to getting the front of the house done, so I think that's going to be on Dan's list of goals for 2017. Next → Making a decision about the front end gables. Several weeks ago I shared my egg preservation techniques in my "Putting Eggs By" blog post. In the comments we discussed an additional method - liming. I mentioned that I'd heard of liming eggs, but was put off trying it because of reports that it affected the flavor of the eggs, making them taste "limey." Others reported satisfactory success with it, so I decided to take my own advice and not rely on what others say, but to collect my own experiential data and see for myself. Pickling lime is food grade hydrated lime. There are different kinds of lime, so it's important to get the correct one (for a rundown on those, see my post on whitewash, here). As an aside, I would never use pickling lime to make pickles, because it's messing with pH which is important for canning safety (more on that here). The eggs need to be fresh, clean, unwashed, and never refrigerated. Do not use dirty eggs. Once the salt and lime are dissolved the mixture is very milking looking. Then I added the eggs. Can you imagine my surprise when the eggs floated? Floating eggs usually means old, unfit-to-eat eggs, but these had been laid within the past several days. The only other answer was the salt. leaving tell-tale little window-like pools on the surface of the crock contents. I dated the crock, covered it, and put it in the pantry next to my water glassed eggs. From time to time I'll try some of these eggs and report my results. We'll see how long they last and how they taste at the end of the experiment. The attraction to this method over water glassing (for me) is that hydrated lime is much easier to come by than water glass. Plus water glass doesn't keep forever, and because I only need a fraction of the container every year, a lot ends up unusable. Lime is powdered, lasts forever, and has other homestead uses, so I keep it on hand anyway. Why do these techniques work? Because egg shells are porous. Over time the water content in the egg evaporates creating an air bubble inside the egg. This is why the float test gives you an approximate idea of how old the egg is (useful for when you find that egg stash the chickens hid on you). This happens faster in warm weather, which is why refrigeration helps increase shelf life too. By submersing the egg in a lime/salt or water glass solution, evaporation can't take place so the shelf life is increased without refrigeration. Also see "A Quick Update on the Limed Eggs." I'm guessing most of you will be able to relate to this, even if I'm a bit awkward in trying to explain it. It's something that I've been thinking about and which Dan and I have been discussing. Sometimes it's so easy to get caught up in an idea or trying to figure out if we can do a thing, that we never really look at whether the time spent is actually worth it. This ought to be part of any project analysis and a deciding factor in what we do and how we do it. Time. I see the time factor as having two components. Personal - for example, a sense of accomplishment, bragging rights, or to increase a sense of self-reliance. I tend to focus on the functional benefit, but always want it to be as pretty as possible. Then I start getting carried away with how to do that and my common sense gets clouded. In a broader sense, one of the biggest reasons we humans buy (or make) things is because it promises to be time and labor saving. If I have this product then I'll have more time to do something else, something I enjoy. On the surface that sounds great, but in reality how much time must I spend to earn enough to buy it? (Or pay it off?) Then how much time and money will be required to maintain and fix or replace said time-and-labor-saving device? I think that sometimes, what we gain on the surface only forces us to dig a deeper pit. All of this seems so clear to me when I write it down like this, but, there's one other factor which is often dominates the decision-making process. It's an elusive one, often hard to recognize, i.e. an emotional attachment to the project or to a particular way the project ought to be done. Emotional attachment has likely undermined many a joint project. "A" wants to do it this way, "B" wants to do it that way, and nothing gets done because the two can't get past having it their own way. At the time it seems so important to be "right," but as Dan likes to say, "Whose gonna notice ten years from now? Whose gonna care?" So how do you analyze whether or not a project or product is worth pursuing? Do you have a decision-making process? Do you try to think it through and consider alternatives, or whether it's really worth it in the long-run? Or are you more impulsive? How's your track record? Do your "that was worth its" outweigh your "that was a wastes?" My track record hasn't always been that great, which is why this post - I'm trying to do better.